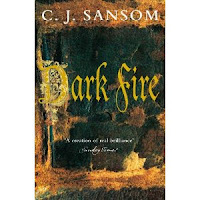 My friend @danether originally recommended C J Sansom to me. Not usually a fan of historical or crime fiction, I was a bit sniffy, but he was right to suggest I try. Matthew Shardlake is a lawyer. One time favourite of Thomas Cromwell, he finds himself embroiled in yet another mystery, surrounding the whereabouts of a mystical substance, Dark Fire, that is rumoured to be a terrible weapon, and one that Henry VIII is determined to own. He finds his fate inextricably linked to Cromwell as the investigation criss-crosses London in a race against time: there are others that want to possess the dark fire and they will do anything - and kill anyone - to find it. Sansom artfully recreates the sounds, smells and sights of sixteenth century London, skilfully weaving historical details around strong characterisations of historical and fictional people. This is one of a series of five Shardlake mysteries. Recommended.